When most people think of hot air balloons they think of colorful, romantic flights taken on vacation in wine growing regions. Delicate flower patterned balloons flying gently, while passengers sip champagne. In Julian Nott's ballooning world, the picture is extraordinarily different. Enduring uninterrupted flights of several days without touching down, skirting thunderstorms and flying over the Sahara Desert, Nott has broken 79 world ballooning records. His patented balloon designs use the most advanced technology and he has created the first entirely new type of balloon in over two centuries. Balloons have been in use for 220 years and their applications continue to develop. More balloons are flown today than at any time in history. Tiny weather balloons make forecasting possible, central to so much human activity. At the opposite end of the spectrum, vastly larger balloons are routinely flown today, and for much longer periods, than at any time in history. At 120,000 feet, so little of the atmosphere is left that it is possible to make many observations just as effectively as from satellites. The instruments carried by some of these giant balloons are of special interest at KITP. The Nobel Prize for physics announced in October 2006, was for measurements of the cosmic microwave background radiation made with the COBE satellite. Precursor instruments for COBE were tested at the very top of the atmosphere under giant balloons before the satellite was launched. Penzias and Wilson's discovery of the cosmic microwave background was first confirmed with an experiment carried under a huge balloon. Experiments on cosmic rays, antimatter searches etc., are currently flown under giant balloons. 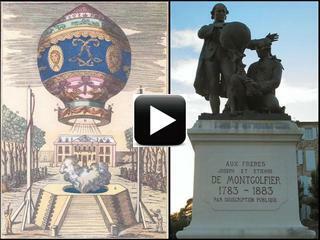 In addition to his own projects, Nott's illustrated lecture covers these achievements, the fascinating history of ballooning and the current wide application of balloons in science and technology. Nott presents the history of ballooning as a microcosm of the history of science and technology, and suggests that there are lessons of intellectual courage to be learned, central to all major human advances, and particularly to scientists exploring the greatest of the uncharted unknowns, the future. Julian Nott The Smithsonian Air and Space Museum has described Nott as "the leading figure in applying modern science to manned balloon design over the last 20 years" and he is the recipient of numbers of leading awards. 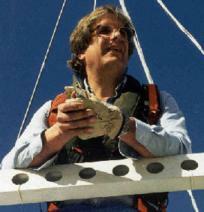 As well as designing and piloting numerous novel balloons, he is extensively involved in scientific and commercial applications of balloons and airships. Nott is helping NASA develop the "Pumpkin Balloon" for very long duration, a concept Nott pioneered. Perhaps the most interesting of his current work is assisting the NASA Jet Propulsion Laboratory to develop balloons to explore Saturn's scientifically fascinating moon, Titan. Audio of introduction by David Gross.